$$$ / Politics / News A bank set up on public land in Grant Park—what's next? The Chicago Park District received $120,000 to allow the PNC bank branch to set up in Grant Park. How much is a piece of Grant Park worth? The question looms after officials turned over a slice of the park to a private company for $120,000. The Park District didn't conduct a bidding or evaluation process to determine if that's a fair price for allowing PNC bank to open a temporary branch on the south end of Grant Park earlier this summer. The "pop-up" branch was recently moved out of the park, but that doesn't mean it won't be back. The district doesn't have any guidelines governing the scope of future lease agreements with private firms, leaving open questions such as how much park space they might be able to use, how long they can last, and what types of businesses or marketing campaigns should be permitted. Park District officials say that the public has little reason for concern, and that they received few complaints about the temporary bank branch. "The Chicago Park District seeks creative ways to raise revenue to support its parks and programs in neighborhoods throughout the city," Jessica Maxey-Faulkner, a spokeswoman for the district, wrote in an e-mail. "We have largely received positive feedback on our efforts to maximize non-tax revenues." But concerned residents and parks advocates warn that it's a slippery slope. "This is where we need to be particularly vigilant," says Cassandra Francis, president of Friends of the Parks. Following the parking meter deal and the rental of city land to private billboard companies, the bank agreement is another example of city agencies selling or renting out public assets for an infusion of cash—before establishing a formal, transparent process for doing so. 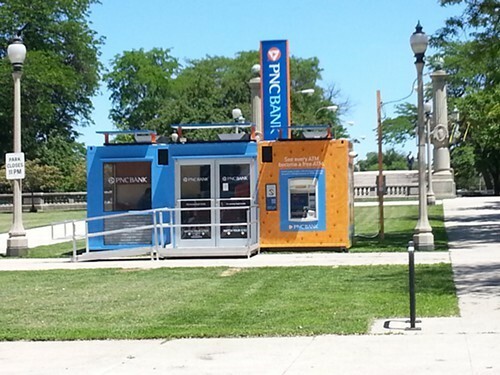 The issue in Grant Park started when PNC bank opened a pop-up branch on the south end of the park at the beginning of May. Resembling a camping trailer, the stand held an ATM and housed two to three employees who signed up new customers and offered administrative services. The branch held no money outside of the ATM. According to the contract, obtained through a Freedom of Information Act request, the bank was granted a special event permit to set up on park space through September 2. The contract shows that the bank requested to stay in Grant Park through June before moving to North Avenue Beach for the remainder of the summer. PNC would pay the Park District $60,000 for each stop. Park District officials say the PNC pop-up branch was only temporary, which Maxey-Faulkner defined as "a short term, removable promotion or structure." But the district doesn't have a written or even unwritten definition of how long a structure can be in place and still be "temporary." In fact, in early July the bank and Park District officials decided to keep the branch in Grant Park through the middle of the month. It was recently moved out of the city. Maxey-Faulkner wrote of the change in timing: "The vendor and the Chicago Park District reserve the right to alter location or promotion structure as necessary." A PNC spokesperson wrote in an e-mail that the time in Grant Park was extended because the branch attracted positive feedback and dozens of new customers. The Park District didn't get any cut of the proceeds. Bob O'Neill, president of the Grant Park Conservatory, said he wasn't bothered by the pop-up bank and heard only a couple complaints about it. He said the park can struggle to bring in vendors and other sources of revenue, and that promotions like the bank can be helpful as long as they stay "within reason." "A positive thing about this PNC thing is it opens the discussion of how to deal with pop-ups," O'Neill said. "We need to explore the whole idea of pop-up branches in general." Francis, however, is more skeptical. While she agreed that private entities are a good source of money for the parks, she believes the pop-up bank set a troubling precedent. She and other advocates wonder how broadly "temporary" might be interpreted. And what other private companies might be allowed to set up businesses on park property? How much money is enough to warrant allowing these pop-ups? Who makes those decisions? Francis said she has tried to arrange a meeting with Mike Kelly, the general superintendent and CEO for the Park District, to discuss temporary permits and other matters. Francis is also in the early stages of a battle over the location of the George Lucas museum, which Mayor Rahm Emanuel has designated for a stretch of public lakefront property south of Soldier Field. There's a good chance that matter will end up in court. At the Artists of the Wall Festival, residents paint Loyola Beach's sea bench to curb graffiti and raise money for the Loyola Park Advisory Council.